Push Your Luck Podcast: Nations : Through the Ages revised...? Through the Ages (TtA) has been THE civilization style game for me. Even though its mostly abstracted and played with cards and cubes, the clever streamline design and direct confrontation available in the advanced game makes it fun but not for the novice player. Indeed, while Through the Ages beats many others, it has some flaws which makes it daunting for new players to jump into it easily. Nations, an Essen 2013 release, seems to take most of the mechanisms and tries to take away the clunkiness while maintaining the essence of the game. 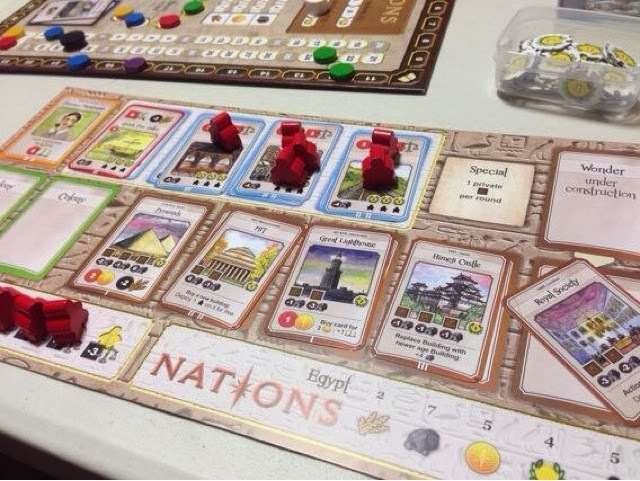 In Nations, players try to grow their civilisations through four ages, maintaining stability, conquering colonies, waging wars and feeding their population to score the most points and win the game. If you are an experienced TtA player, you will recognize many of the same mechanisms. There is a tableau where you can obtain cards from but in Nations you will have to "build them" and they come into play immediately. There are also way more cards available than in TtA so competition will be fiercer for the cards you want. Building units/buildings is simplier in Nations. In TtA, its possible to have Level 1 and Level 2 buildings in the same slot. This is different in Nations in that you can only keep 1 card per slot and thus you have to decide which to replace. Furthermore, when replacing, any meeples (similar to cubes in TtA) will be removed thus forcing you to spend resources again to "rebuild" (place) the meeples into the building. This makes for painful decisions to be made. Nations uses tokens to represent resources which is a clearer system than how TtA does it. While there are no direct attacks against each other like in TtA, Nations does provide ability to sabotage other players and it is through War. Players can "buy" the war card and set the war level to their current military levels. This means that at the end of the round, whichever player does not meet that military level will often suffer penalities. So while Nations seems like a spawn of TtA, there are some new features that makes it different. For starters, there is a difficulty level which you can set in the game for yourself. Thus players of higher experience can set themselves to be handicapped and still have a challenging game with novices. Each player can also start as a different nation with specific characteristics and this allows more replayability and variable player powers at the beginning. There are less cards to manage on your own tableau due to the lack of spaces available. Still, Nations does seems to have some glaring issues. Quite a few of the cards especially the later Age leaders seems to gear towards military. Indeed, a lot of the bonuses from colonies are lucrative enough such that you cannot totally ignore military. If I recall, I think this is similar to TtA but can be mitigated. The penalties from War though may not be that painful. As long as you have high Stability, you can ignore the resource penalty and just lose 1 point per round. Some cards are also not scalable due to the player count. This is also evident in the end of round scoring when in a 5 player game, the player who has the most Books will score 4 points per round. This can be quite a large advantage but won't be so evident if it was a 2 player game. While the components is ok, the art is very ugly. I am quite put off by the art as I often like to let my eyes roam across the board and cards while its another player's turn. We found that we did not use a lot of the extra meeples because they either cost too much food to feed per round OR reduce our stability which seems to be required for many end of round scorings. It was in the last 2 rounds when we decided to grab meeples instead of resources as our start of round bonus. The rule book could also have done with better formatting, highlighting key rules and points and providing a better summary overall. We tried playing it 1 round the first time and it was tough to get through it all. We played with 5 a second time as we had 5 and even though the rulebook mentioned its not advisable to, we perservered. I manage to win with 3 points even though I was quite sure I was losing out to my friend who had 4 points each round due to his Books. I was not very high up in military but my nation was stable enough that it mitigated most of the penalities. Most of my points came from my wonders and as the Egyptian I had a 3 point bonus (pyramids were already built) so thats what won me the game which kind of seems unfair. So all in all, while it was interesting to play, I don't think I will want to play it again or own a copy. Comparing this to the other civilisation games, it definitely feels like TtA revised edition. I would much rather play TtA though because while it can be unwieldy with all the cubes, it feels like a more balanced game. Definitely Try it first!